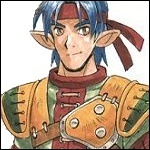 Synbios is a young general in the Republic army, hailing from the territory of Flagard. 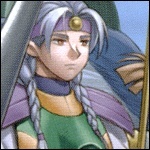 His father, Conrad, was a famous general within the Destonian Empire and was one of the key players in Aspia's separation from Destonia. Due to Conrad's poor health Synbios has to fill his shoes at the peace negotiations in Saraband between Aspia and Destonia. Much is expected of this young man but the doubts of some Republican generals are laid to rest quickly as he proves himself a powerful and more than competent leader on the battlefield. Synbios' involvement in the war between Empire and Republic following the disintegration of the peace process sees him found a strong relationship with Medion, 3rd prince of the Empire. Synbios' valour and determination help him establish his force as one of the strongest divisions of the Republic army. 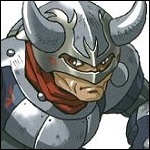 Dantares is a competent centaur knight who accompanies Synbios to Saraband. He requested Synbios be there as he believed he could make a difference to the proceedings. Dantares is Synbios' right-hand man and often jumps into the battles in Synbios' defence, and feels honoured to serve under his command. Dantares' hometown is Flagard, and he has known Synbios since he was quite young. Masqurin has lived in Flagard working for Lord Conrad for many years and is a close childhood friend of Synbios, Grace and Dantares. Although she has the appearance of a child her elven life has actually been much longer. She travelled to Saraband with Synbios and the others to lend him friendship and support and she is also a useful mage in battle with her powerful fire magic. She is a bright and happy person, and sometimes mischievous always teasing and chattering with the rest of the troops. Grace is a companion of Synbios' from their homeland of Flagard. 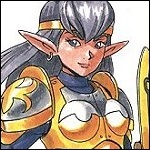 She accompanied Synbios along with Dantares and Masqurin to Saraband for the peace processes. When negotiations failed due to the Emperor's 'kidnapping' Grace joined Synbios' army as their priest and healer. Grace's light magic lends useful support to the Synbios division. Grace's race is called Kyantaur, which is a halfling of some sort. Hayward becomes a member of the Saraband Bridge guards 'while searching for a master archer' and remains with them until the abduction of the emperor by Bulzome, where he is found by Synbios. He realises Benetram is innocent and chooses to leave the bridge guards and join Synbios' battalion. Obright was part of the Produn army which was stationed in Railhead for the duration of the peace conference. Upon the outbreak of war Imperial General Garzel's army ambushed Produn's army and Obright was separated from the main force. He ended up in dwarf valley and came to the rescue of a young boy, Toby, who had disturbed a monster and was about to pay the consequences. During Obright's struggle with the monster he was knocked unconcious and awoke in the rustic village of Balsamo, Toby and his friend Duncan had escaped from the monster and brought Obright back with them. 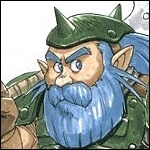 Although he survived both the threat of Garzel and the monster in dwarf valley, Obright would be looked down on as a deserter if he returned to the Republic, but if he stayed much longer in Imperial territory he would not last much longer. When Obright discovered that Benetram along with the Synbios army were stranded in Balsamo he came to their help and brought them to Duncan who had been digging a secret tunnel under the walls of Balsamo. Duncan, owing to Obright's bravery back in dwarf valley, let the Republican army use his secret tunnel to escape capture by the Empire and Obright joined the Synbios division to help return Benetram to Aspia. The Synbios army discovered Irene in Railhead after she tried to hide amongst the train cargo. She comes from a land 'to the east' and her speech is broken since she is not yet used to the language. She is a monk and was taught all she knows in combat by her tutor Unoma. She joins the Synbios army after they rescue her from a pack of thieves looting the cargo. Cybel was cut off from the Varlant army when it was attacked by general Spiriel and was unable to assist Varlant at his darkest hour when he face his undoing at the hands of Medion�s army. As a result of this, Cybel felt her pride as a knight shattered and was unsure what to do with her life from then on. After the battle at the railway switching point Synbios� army found Cybel. 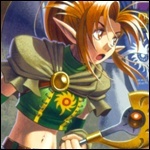 She told Synbios, Dantares and Benetram her story and Dantares offered her a place in the Synbios army if she needed to re-affirm her pride as a knight. Cybel agreed and travelled with Synbios� army from then on. A birdwoman who works for Lord Conrad of Flagard with her younger brother Zero. 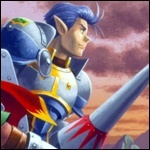 Eldar is very protective over her brother's safety and also very loyal and close to Lord Conrad. 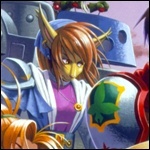 She and Zero were sent to find Synbios after Conrad received the news of war breaking out and joins the Synbios army to help him defeat a group of thieves who have attacked the train they are riding on. 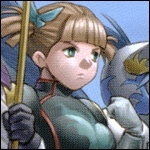 She remains at their side to help protect Benetram and Synbios. 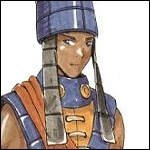 Kahn is an elbesem monk who Synbios' force found in the village of Quonus when searching for Julian. 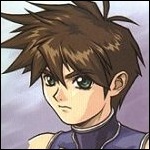 Kahn joins the force after the battle with the Kyon-shi when they enter the mansion to destroy the vandal who has the village under his control. With the help of his Elbesem Orb the force are able to break the seal on the vandal and defeat him, thus being able to win the battle. Kahn then goes along with Synbios' force. Noon is a mysterious elven wizard who has spent many years travelling around searching for 'the ultimate summon spell' to increase his powers. His travels led him to Quonus village where his dabbling in black magic got him caught up in the problems of the people there. 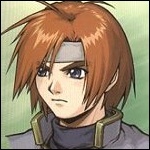 The Vandal that had taken over the town, after the deal with Governor General Garvin turned him into a Kyon-shi along with the other villagers. He specialises in ice and dark magic. After Synbios saves the villagers of Quonus he joins his army to regain his confidence as a wizard after the mistakes that led him to be mixed up with the Quonus Vandal. 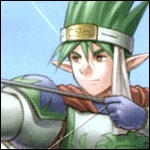 Justin was general Edmund's loyal right hand man and a competent bow knight on the battlefield. However, on the march back to Aspia, Justin got into an argument with his general about the Empire and Republic he was left behind in the roaming camp Vagabond with Edmund's wounded soldiers. When Synbios and Benetram meet him Justin is reluctant to talk about his argument with Edmund (his loyalty is still placed with his general) and asks to be left alone. But as the Synbios army is leaving Vagabond to pursue Spiriel, Justin asks if can accompany them so that he may yet convince Edmund not to carry through with his plan . . .
'The mighty Horst' is a mace-wielding soldier from the Tybalt battalion, who requests to join Synbios' battalion because the Tybalt battalion weren't going to be doing any fighting while idly stationed in Aspia. 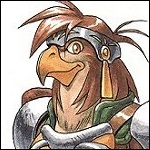 Horst feels comfortable in Synbios' battalion as it is composed mainly of renegade soldiers like him. 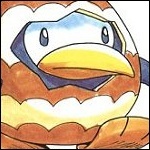 Penn's egg is found inside a tent in Vagabond and hatched by Synbios' force. They meet him in Storich, and he is willing to join the force due to the fact that the Bulzome sect is enemies of his friends in the north. 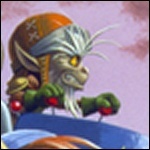 Ratchet is a goblin scientist who used to work for Governor General Garvin and studied the power of steam. He was handed over to the Quonus Vandal as part of its deal with Garvin and remained its servant until Synbios and his army killed the Vandal. Once he was free he left to test out his newest invention, a steam suit machine. Later he caught up with Synbios's army and joined them as thanks for rescuing him. Frank is a werewolf and a resident of Flagard town. He was the only person willing to step out into the streets of Flagard during the Bulzome sect's 'visit' to the town. Frank has a sixth sense for evil and often smell trouble well before anything happens. Frank likes pushy people. 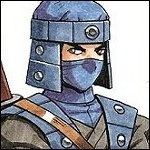 A mysterious ninja from the Momoichi clan, discovered hiding out in the Lookover Tower ruins by Synbios. 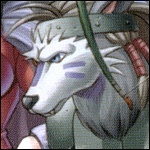 He joined the Synbios army in the hopes that they can keep him safe from the members of his clan hunting him. 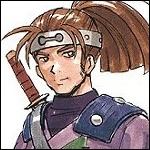 Murasame is a ninja spy who works for Aspia. He appears when Synbios is about to run into a Bulzome trap on the great wall, warning the force before they could stray into it. With his help Synbios defeats the Golem, and Murasame goes ahead to check on Malorie for them. Synbios' force fall into Wilmer's trap, and meet up with Murasame, who calls the rest of the force to allow them to defeat Wilmer. 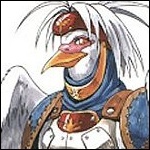 Fynnding is a birdman and serves Malorie castle and Lord Tristus. During Prince Arrawnt's invasion of Aspia Fynnding is locked up in Malorie's dungeons by Tristus' second in command, Wilmer. The reason for this being that he doesn't fly to Tristus and inform him that Arrawnt has captured Tristus' son Algernon and that Aspia is under Imperial control. Doing this would put Algernon's life at risk, as Tristus would immediately deploy the Malorie army in an effort to regain Aspia, even if this meant sacrificing his own son. When Wilmer is defeated by Synbios, Fynnding is released and joins Synbios' army to lead the secondary unit's raid on the dam outside Aspia, coinciding with Duke Palsis' brilliant plan to defeat the holy warrior.